Compliance and Risk, Operations, and Quality Control executives, along with process and maintenance supervisors in the pharmaceutical, biotechnology, and food and beverage industries, have been clamoring for highly robust, reduced-risk, accurate, easy-to-clean dry-cell pressure measurement technology for some time, and WIKA has delivered again. The new WIKA Model PG43SA-S pressure gauge has been specifically designed for the demands of sanitary applications. This accurate and reliable sanitary gauge measures pressure using a revolutionary dry-cell technology, so there is no transmission system fill fluid behind the diaphragm of any kind that could possibly contaminate the process media if a breach in the diaphragm was to occur. Moreover, this new stand-alone gauge for sanitary applications utilizes a mechanical driven pressure measuring system in place of a hydraulic pressure transferring system, and the innovative design also offers high overpressure protection. When hygienic pressure measurement is required for applications in the pharmaceutical, biotechnology, food processing, and beverage industries, the new WIKA Model PG43SA-S pressure gauge is the ideal instrument for the job. 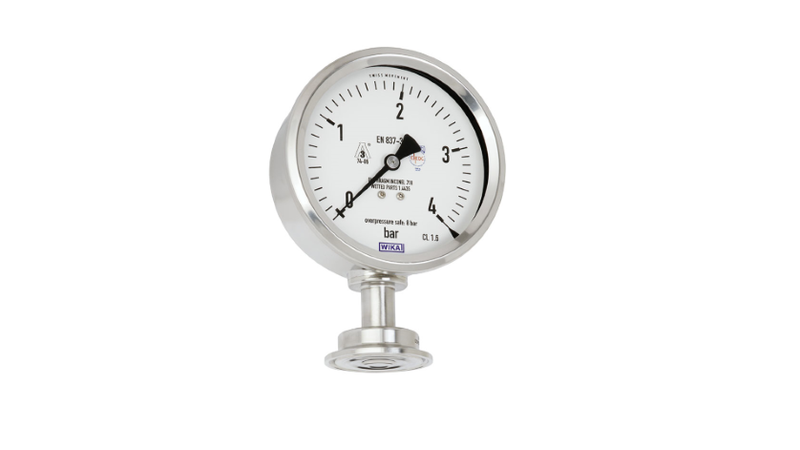 This reliable, robust sanitary gauge offers accurate mechanical pressure display for piping systems, fermenters, bioreactors, and other process vessels in manufacturing facilities and labs. Specific applications include pressure or vacuum monitoring during manufacturing processes, cleaning operations, transportation vessels, or pressure testing. This multipurpose sanitary gauge can be used to measure almost any kind of liquid, paste, powder, or crystallizing media, and gases, compressed air, and vapors. This dry-cell flush diaphragm pressure gauge is ideal for monitoring ultrapure steam generation and water (e.g., WIF, water for injection), and can also be used as a standalone pressure reading for tanks not requiring an external power supply. This gauge is an excellent choice for rough process conditions, vibrations, or pulsations. The WIKA product development team came up with an innovative hygienic pressure gauge design that can handle cleaning-in-place (CIP) sterilization-in-place (SIP), autoclaving and can also be used in wash-down areas. Ease of cleaning leads to notable time and labor savings compared to traditional gauge designs. The sensing diaphragm is constructed from Inconel Alloy 718 (high nickel content and approx. equal chromium content to 316L stainless steel) for high corrosion resistance. It is 2–5 times thicker than the typical 316L stainless steel diaphragm, making it less prone to physical damage. The Model PG43SA-S pressure gauge features a polished stainless steel case and a rugged stainless steel movement to avoid potential corrosion of non-compatible materials with the cleaning agents. It is designed to operate in ambient temperatures from –20 to +60°C, and with media ranging from –20 to +150°C. This precision instrument has an accuracy class of ±1.6% of full scale. As an additional convenience, the pressure instrument zero setting can be easily adjusted by removing the sealing plug on the top of the case, and with a slotted screwdriver reposition the gauge pointer. Check out the product data sheet to learn more about WIKA’s newest dry-cell pressure gauge for the sanitary sector. As always, remember WIKA’s expert technical support team can answer any questions you have about sanitary gauges or other products.